Airbus Development has found in Numalis an innovative company with high chance to create jobs in Occitanie but also a technical solution for many Business Units in the group, for launchers, satellites, planes, etc. The signing of this convention with a company in Montpellier, a first for Airbus Development since the enlargement of the region in 2016, launch a new partnership for the two parties. 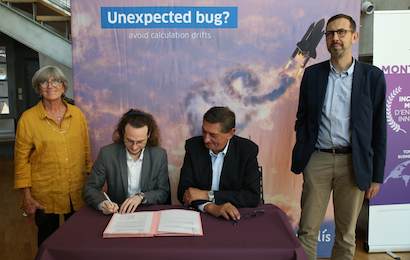 “We are very proud to help for the first time a start-up in Montpellier, which proposes high-end solution meeting the need of Airbus to check efficiently critical embedded software” said M. Michel Sesques, CEO of Airbus Development. This convention will allow Numalis to benefit both of the expertise and the network of the Airbus group, but also its financing solution. Arnault Ioualalen, CEO of Numalis: “we are doubling our personnel in 2018, this partnership will allow to continue our growth and made us known even more in the aeronautic sector, where our solutions are particularly relevant”.